Barrina LED T5 Integrated Single Fixture is a great option for lighting up garages, basements, work areas, utility rooms etc.. It provides you much brighter, cheaper and healthier lighting than conventional fluorescent light and can easily replace any existing fixtures. 3-year unlimited warranty, contact us to get easy and fast replacement. • Highly efficient 100~110 lumens output per watt. • Low power consumption and low thermal output. • Environmentally friendly: mercury free. • Lower maintenance costs compared to existing lighting. • Long life span: 50000 hours - lasts up to 10x longer than conventional lighting. garage, offices, plazas, hospitals, hotels, subways, terminal buildings, schools, supermarkets. SUPER BRIGHT - More than 2200 lumens output, 20w low power consumption, Save 65% on your electricity bill. LINKABLE - Extendable design, could connect up to 6 tube lights together with seamless connectors or connector cords. EASY INSTALLATION - Plug-and-play. Just use the included snap joints to hang it up and insert the plug to light it on. 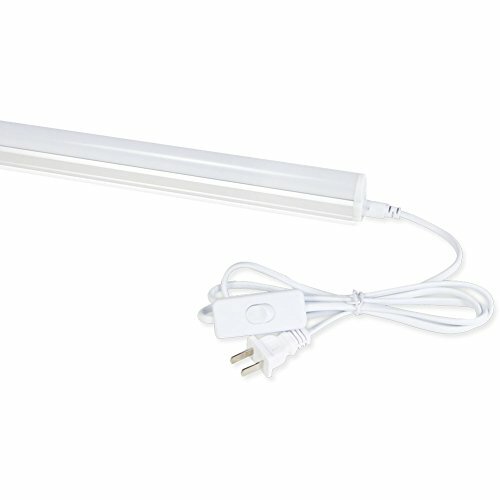 WIDE APPLICATION - Perfect for garage, storage area, workbench, basement, home, under cabinet, office general lighting. QUALITY ASSURANCE - 3-year unlimited warranty, contact us to get easy and fast replacement. If you have any questions about this product by Barrina, contact us by completing and submitting the form below. If you are looking for a specif part number, please include it with your message.